Get 20 free spins on Northern Sky when 4 line bets on SuperEnalotto are purchased. How to claim: (1) Player must be logged into their Account, (2) Click on the link provided on the Promotions Page, in the email, SMS or mobile push received by the player OR manually enter the promotion code COMENADVENT118 into the shopping cart, (3) purchase a minimum of 4 SuperEnalotto line bets, (4) 20x "Northern Sky" spins will be credited to the Player’s Account after completing the purchase. This offer will expire Monday 31st December 2018 at 23:59 CET. Additional terms: This offer is redeemable once per player. Any unredeemed free spins will become void seven days after being credited into the Player’s account. Free spins redeemed as part of this promotion may only be used on the game “Northern Sky”. Get 4 Cash4Life line bets and 5 MINI Lotto line bets for €7.50 - a saving of €4.50. Get 4 German Lotto line bets, 3 SuperEnalotto line bets, 30 Elephant scratchcards, 5 Santa scratchcards & 1 x 777 scratchcard for €9.99 - a saving of €3.51. Get 10 line bets on German Lotto for €7.50 - A saving of €2.50. Get 3 line bets on SuperEnalotto for €4.50 - A saving of €1.50. Get 10 free spins on Jack in the Box Christmas Edition when 4 line bets on EuroJackpot are purchased. How to claim: (1) Player must be logged into their Account, (2) Click on the link provided on the Promotions Page, in the email, SMS or mobile push received by the player OR manually enter the promotion code COMENADVENT618 into the shopping cart, (3) purchase a minimum of 4 EuroJackpot line bets, (4) 10x "Jack in the Box Christmas Edition" spins will be credited to the Player’s Account after completing the purchase. Additional terms: This offer is redeemable once per player. Any unredeemed free spins will become void seven days after being credited into the Player’s account. Free spins redeemed as part of this promotion may only be used on the game “Jack in the Box Christmas Edition”. Get a 25% credit bonus on you deposit amount of up to and including €100. Duration of bonus once redeemed is 1 month. 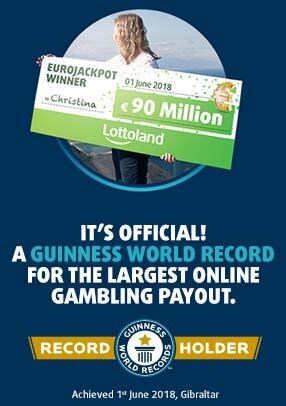 Minimum deposit amount to qualify for bonus is €10. Get 1 Powerball line bet, 2 SuperEnalotto line bets, 5 Cashball scratchcards and a 1/50 El Gordo share bet for €15.99 - A saving of €5.50. If any share bet(s) on El Gordo are purchased after the El Gordo cut off date (22nd December 9:00 CET), the share bet(s) will be in play for the 2019 El Gordo draw. Get 10 x 100k scratchcards for €7.50 - A saving of €2.50. Get 10 free spins on Jingle Spin when an El Gordo share bet of 1/50 is purchased. How to claim: (1) Player must be logged into their Account, (2) Click on the link provided on the Promotions Page, in the email, SMS or mobile push received by the player OR manually enter the promotion code COMENADVENT1018 into the shopping cart, (3) purchase a minimum of one El Gordo share bet of 1/50, (4) 10x "Jingle Spin" spins will be credited to the Player’s Account after completing the purchase. Additional terms: This offer is redeemable once per player. Any unredeemed free spins will become void seven days after being credited into the Player’s account. Free spins redeemed as part of this promotion may only be used on the game “Jingle Spin”. Get 2 SuperEnalotto line bets, 1 MegaMillions line bet and 5 Santa's Scratch scratchcards for €6.99 - A Saving of €2.01. Get 10 FREE Spins on NEW Leprechaun Carol when 3 Irish Lotto line bets (without Lotto+) and 20 Super Shamrock scratchcards are purchased. How to claim: (1) Player must be logged into their Account, (2) Click on the link provided on the Promotions Page, in the email, SMS or mobile push received by the player OR manually enter the promotion code COMENADVENT1218 into the shopping cart, (3) purchase a minimum of 3 Irish Lotto line bets (without Lotto+) & 20 "Super Shamrock" Scratchcards, (4) 10x "Leprechaun Carol" spins will be credited to the Player’s Account after completing the purchase. Additional terms: This offer is redeemable once per player. Any unredeemed free spins will become void seven days after being credited into the Player’s account. Free spins redeemed as part of this promotion may only be used on the game “Leprechaun Carol”. Get 5 Everyday Payday scratchcards for €7.50 - A Saving of €2.50. Get 4 EuroJackpot line bets for €6 - A Saving of €2. Get a 1/10 share bet on El Gordo, 1 EuroMillions scratchcard & 5 Mini Lotto bets for €30 - A saving of €8.99. Get 10 free spins on Jingle Spin when 20 Santa’s Scratch scratchcards are purchased. How to claim: (1) Player must be logged into their Account, (2) Click on the link provided on the Promotions Page, in the email, SMS or mobile push received by the player OR manually enter the promotion code COMENADVENT1618 into the shopping cart, (3) purchase a minimum of 20x “Santa's Scratch” Scratchcards, (4) 10x "Jingle Spin" spins will be credited to the Player’s Account after completing the purchase. Get 10 Santa's Scratch scratchcards, 10 Elephant scratchcards, 10 Super Shamrock scratchcards, 10 Raid the Piggy Bank scratchcards & 10 Horseshoe scratchcards for €6.99 - A saving of €1.51. Get a 1/10 El Gordo Share bet + 6 German Lotto line bets for €30 - A Saving of €10.99. Get a 1/20 Gordo share bet for €15.99 - A Saving of €4. Get 30 FREE Starburst spins when 5 German Lotto lines are purchased. How to claim: (1) Player must be logged into their Account, (2) Click on the link provided on the Promotions Page, in the email, SMS or mobile push received by the player OR manually enter the promotion code COMENADVENT2018 into the shopping cart, (3) purchase a minimum of 5 German Lotto line bets, (4) 30x "Starburst" spins will be credited to the Player’s Account after completing the purchase. Additional terms: This offer is redeemable once per player. Any unredeemed free spins will become void seven days after being credited into the Player’s account. Free spins redeemed as part of this promotion may only be used on the game “Starburst”. Get a 1/100 El Gordo share bet, 1 Mega 2019 line bet, 10 NEW Christmas Scratch Scratchcards for €9.99 - A Saving of €3. Get a 25% discount on scratchcards of up to and including €100. Get 5 Ten Lucky Years scratchcards for just €7.99 - A Saving of €2.01. Get 1 Mega 2019 line bet, a 1/50 share bet on El Nino and 1 Happy New Year scratchcard for €12.99 - A Saving of €4.